Peas and carrots won't get this kind of kitty love. Many pet owners are opting for more natural foods for their pets. If you're considering making your own cat food, it's important to know what foods are best for them. Cats are carnivores and their primary food source should be meat. Poultry is an excellent source of protein for cats. The majority of protein should be derived from skeletal muscle, such as the breast and thighs, rather than organ meat. Chicken and turkey breast are classified as lean meat, which is the best calorie source for cats. Duck meat is also safe but is higher in fat, so it should be fed more sparingly. Always make sure that poultry is cooked to 165 degrees Fahrenheit to kill pathogens. Beef is another affordable meat option for cats. Ground beef is cheap, easy to prepare and easy for cats to digest. Beef organ meat can also be used, although organ meat should only make up a small portion of a cat's diet. Beef must be cooked to an internal temperature of at least 145 F to be considered safe. Ground beef must be cooked to 165 F.
Pork is safe for cats to eat, although ham and bacon should be avoided. Smoked meats have a high sodium content and can contain sulfites, which are not ideal for cats. Pork should always be cooked to an internal temperature of 140 F.
Lamb and veal are both safe for cats to eat, although they are pricier than most other options. Lamb is often fatty, so should only be fed in small quantities or should be trimmed of excess fat before feeding to your cat. Lamb and veal should be cooked to an internal temperature of 145 F.
Just about all fish is safe for cats to eat in small quantities. 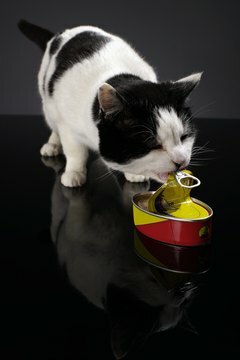 Canned tuna and salmon are affordable options for cats and can be served as an occasional treat. 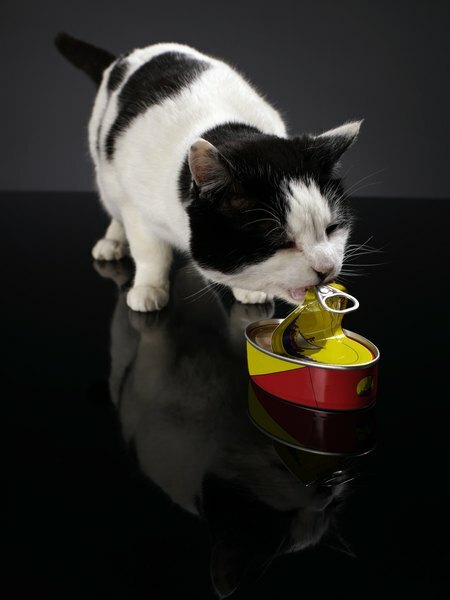 Canned fish has much higher sodium content than cat food, so it should be fed sparingly. Also, carnivorous fish such as tuna and salmon contain higher levels of mercury, which is dangerous to your cat if it accumulates in the system. Smaller fish like cod, halibut and flounder are safer for cats to eat because their flesh contains less mercury. If you're willing to splurge, you can treat your cat to many other types of seafood, such as shrimp, scallops, and calamari. Small sea creatures are considered to contain much less mercury compared to large ocean fish. Oysters and clams can also be served in small quantities. Seafood must be cooked until the flesh is opaque. Start small when feeding your cat seafood for the first time and watch for adverse reactions after eating, as some cats can be allergic to seafood.